The purpose of our memorialization project is to gather, record, and disseminate information about U.S. military installations and facilities overseas named for fallen servicemen and women during war time and to honor their memory. Such facilities in Vietnam took the form of base camps, military compounds, fire support bases, patrol bases, and landing zones; headquarters buildings, operations centers, ammo storage areas, tank farms, and rock quarries; hills, ports, and beaches; hotels, bachelor enlisted and officer quarters; dining and mess halls, enlisted, NCO and officers clubs; hospitals, clinics, dispensaries, medical wards and aid stations; hangars, heliports and airfields; chapels, libraries, and day rooms; movie theaters and amphitheaters; baseball fields and swimming pools; commo sites and relay stations; parade fields, quadrangles, and bridges; trails, roads, and avenues; bays, coves, and rivers; and, finally, monuments, plaques, and honor rolls. The project is self-funded. We do not ask for, nor solicit, donations - nor is anyone authorized to do so on our behalf. The purchase of any Bows book from this website, or at book signings in which we participate, is an investment in future publications, and enables us to continue our research. We would like to thank service members, veterans, families, and others who have participated in supporting the project by furnishing information and photographs. Without you, most of this information would be lost. The memorialization project began in 1987 under the name Vietnam Military Lore by historian and author Master Sergeant Ray Bows, US Army, Retired. Ray's original work recorded those honored during the Vietnam War when installations and facilities were named in their memory. In 1987, Bows visited the Department of the Army's Casualty and Memorialization Branch in Alexandria, Virginia, and learned that of the numerous military installations he had encountered during his time in Vietnam, less than a dozen were on file. He then went to the US Army's Hoffman Building and poured through tens of thousands of orders, seeking those which memorialized base camps in Vietnam. His results increased from less than a dozen to approximately eighty US Army facilities and installations. Bows then researched the other services within the Department of Defense (DoD). Ray's 1988 book, Vietnam Military Lore...Another Way to Remember 1959-1973, included 127 such namings. His 1997 book, Vietnam Military Lore - Legends, Shadows and Heroes, included 53 chapters and told of the early years from the death of US Army Colonel A. Peter Dewey on 26 September 1945 through to the Battle of Dong Xoai on 10 June 1965. In 2001, Ray's wife joined the project, encouraging Ray to expand upon his original work. 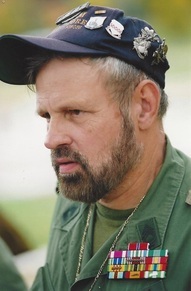 Since then, he has identified over 800 installations and facilities in Vietnam which are included in his 2015 book "IN HONOR AND MEMORY", and in 2016 Bows completed his book "CAMP FRENZELL-JONES: Home of the Redcatchers in Vietnam", the story of PFC Herb Frenzell and SGT Billy C. Jones, for whom Camp Frenzell-Jones in Long BInh was named. Dedicated to this project and determined to see it through to its completion, Master Sergeant Ray Bows and his wife, Pia, continue their research. Please visit this site occasionally as more projects are completed. Ray Bows, born in Massachusetts, joined the US Army at the age of seventeen, in January 1963, completing basic training at Fort Dix, New Jersey, and US Army Transportation School at Fort Eustis, Virginia. In 1963 he volunteered for Korea where he was stationed at the US Army Chemical Depot, Camp Mercer. He then volunteered for an inter-theater transfer to Europe, where he, fortunately, was assigned to the Rail Transportation Office (RTO) in downtown Paris, France. After three years in Paris, and a brief stateside assignment, he volunteered for Vietnam where he was assigned from June 1968 to June 1969. Among other transportation assignments, he was assigned to the 25th Infantry Division at Cu Chi where he coordinated convoy movement within the Iron Triangle and III Corps. After Vietnam, he was assigned to Germany, Belgium, and again to Korea for a total of almost sixteen years overseas service. He retired from active duty in February 1983, at which time he began researching and writing about the Vietnam War. Master Sergeant Bows is the recipient of the Bronze Star, Meritorious Service Medal, Joint Service Commendation Medal, Army Commendation Medal, Army Achievement Medal, and the 1st Infantry Division's Professional Brotherhood Award. In the 1970's he penned a column for the European Edition of the Stars and Stripes.